“Every year, over 300,000 tons of medical waste is generated in India,” UN Industrial Development Organization (UNIDO) Director-General Kandeh K. Yumkella said today in a news release. 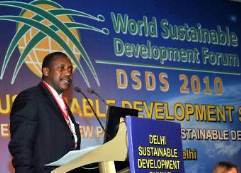 UNIDO Director-General Kandel K. Yumkella speaking at the Delhi Sustainable Development Summit on 6 February 2010. Photo Courtesy of UNIDO. The five-year project will be implemented in Gujarat, Karnataka, Maharashtra, Orissa and Punjab states, with Bangalore’s M.S. Ramaiah Medical College acting as national implementation body. Four large, eight medium and 16 small hospitals in each state will benefit from the project. The project will help reduce persistent organic pollutants (POPs), especially dioxins and furans that are generated when bio-medical waste is not incinerated at the prescribed high temperatures of over 1000 degrees Celsius. This will be achieved by introducing non-burn technologies like microwave and autoclave.